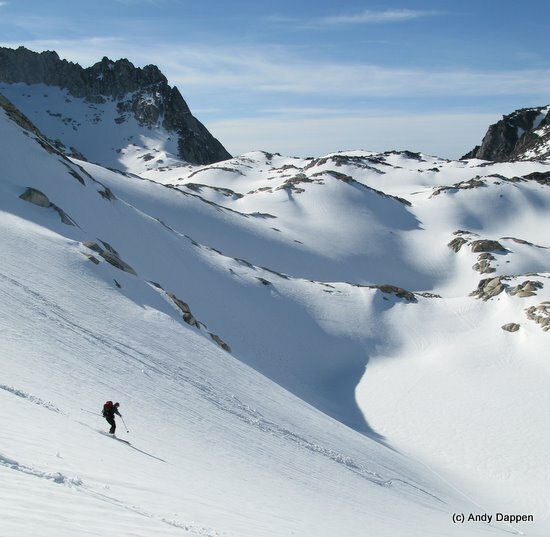 Photo: It may look like the Alps but it’s actually Aasgard Pass (Enchantment Lakes Basin). In the late 1970s we skied the Alps together. We had both received Watson Fellowships that funded a year-long independent study in Europe. Bill was studying development issues in mountain resorts around the Alps; I was studying educational and therapeutic applications of outdoor recreation in these same places. So teaming up to ski tour together, you see, had little to do with self indulgence and everything to do with the noble pursuit of higher truths. The zenith of our adventures together was a trip into the Panossiere Hut, located in the Pennine Alps of Switzerland. Here we skied peaks like the Combin de Corbassiere and the Petit Combin in whiteout conditions …waiting. Finally the weather broke and we attacked the Grand Combin, a peak that would prove to be the culmination of our mountain experiences together. 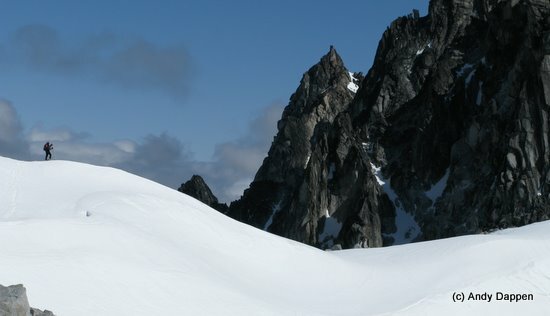 On May 3, we left the hut at 3 a.m. aiming skis through the ink of night toward the peak’s northwest rib. As we climbed the Corbassiere Glacier, a charcoal sky spackled with stars bled itself silver before the sun sprayed the high clouds pink. Breaking through deep powder snow, we reached the 3,400-meter level (11,000 feet) by 6 a.m.. Here we cached unnecessary equipment before turning toward the steep slopes flanking the mountain’s northwest rib. At 3,700 meters, we strapped skis to packs and booted upward. 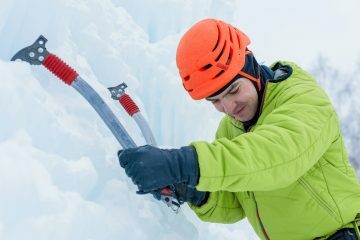 The rope came into play as we hastily belayed pitches through an ice fall and around leaning seracs. By the 4,000-meter mark, the steepest ground lay below and we trudged through knee high powder toward the peak’s 4,314-meter (14,000-foot) apex. We stood on the hallowed ground of the summit 12 hours after leaving the hut. The summit views toward Mt. 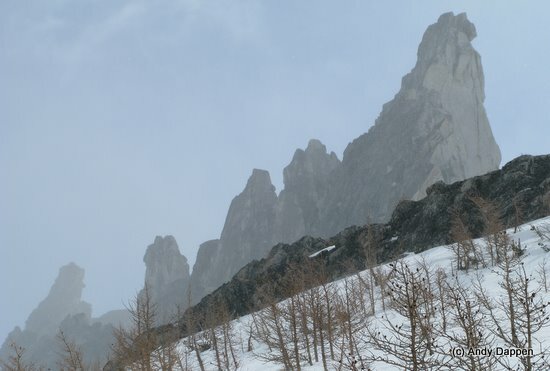 Blanc and the spires of Chamonix were captured on film, but only the flawed wetware of memory captured the steep descent of this particular May day. Perhaps these memories have warped over the years but I remember the rapture of busting out of the powder and freefalling with each turn of the skis. Thousands of vertical feet lower we collected our cached equipment and climbed on skinned skis to the Col de Boviere where we kicked off an avalanche, descended the slide’s steep running surface, jumped a small bergschrund, and began a long descent of the Glacier de Boviere. As we dropped, the snow morphed from chalky powder to bottomless glop. At 2,250 meters, the snow turned to grass and we walked through fields of yellow lilies into the hamlet of Bourg St. Pierre where, 17 hours after starting, we found a cheap inn and crashed. Back in the States, Bill and I were coasts apart in our residences and at opposite ends of skiing trends. A decade after our Euro touring he called to find out what new alpine-touring gear he should consider purchasing. 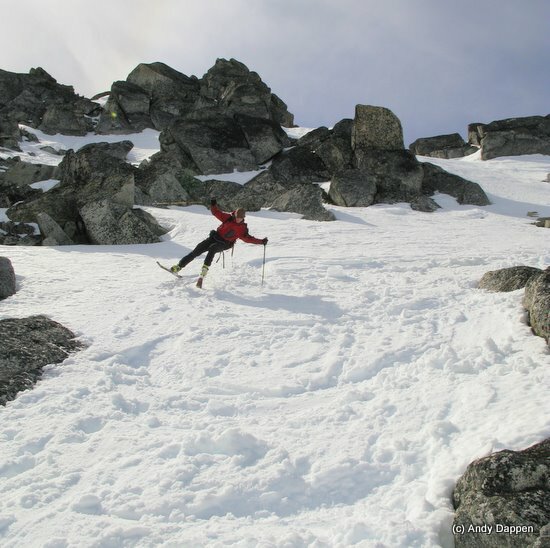 “Don’t use that stuff anymore,” I told him, “I’m on Nordic touring gear.” I explained how, for the long approaches and moderate terrain of North American skiing, skinny telemark skis and light leather boots were the ticket to ride. 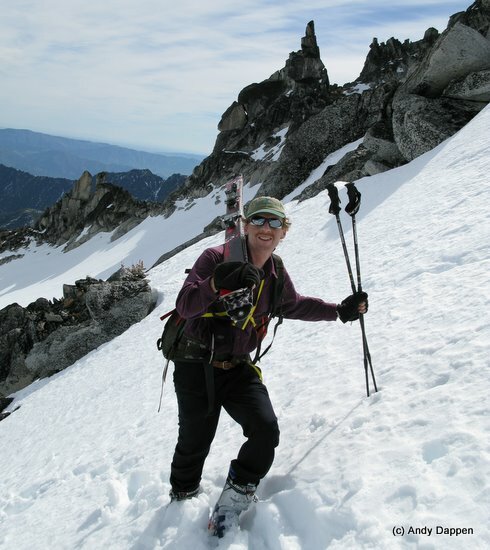 Another decade passed and when he called to find out what new Nordic equipment to add to the quiver I told him, “Don’t use that stuff anymore…I’m back on AT gear.” I explained why fixed heels fixed my skiing problems on the steeper terrain I was now exploring. As we skin up Aasgard Pass toward the Enchantment Lakes, Bill is questioning the wisdom of our reunion tour. 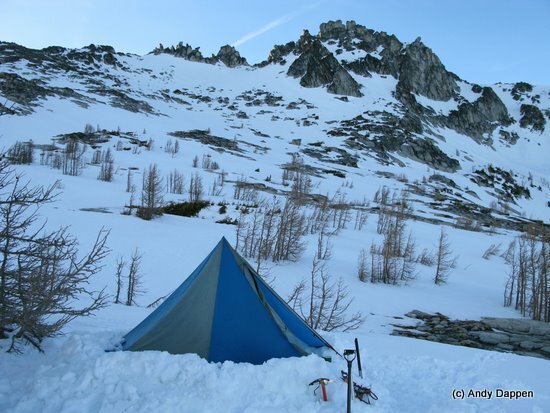 Unlike Europe where we skied with light packs and relied on ‘Refuges’ (huts) for shelter, warmth, and even food, we’re on a death march today—we want to transport our six-day load into the Enchantments in one push. Bill weighs a scant 150 pounds, meaning his 50-pound pack weighs 33 percent of his body weight. Having skied more over the years, I’ve learned what I can live without. I’ve also invested in lighter gear. So while I’m toting the same amount of food and group gear, my pack weighs in at 38 pounds. With me weighing 185 pounds, my load represents 21 percent of my body weight. That brings me closer to an important principle of enjoyable ski touring: Keep the load light enough that you’re its master, not its mule. Bill’s 21-year-old son is also skiing with us. 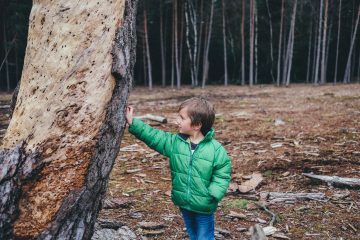 Jake is young and strong and pays little attention to ratios that preoccupy the aged. He pushes hard on occasion and then waits patiently for Team Antiquity to catch up. Despite the weight of Bill’s load and the stiffness of his Garmont boots, which he dubs the Guantanamo Torture Boots for the blisters they brand on his shins, we eventually top Aasgard Pass. Then we glide into the middle of the lake basin and pitch our floorless tent (a Mega Lite) in the lee of a larch krumholtz. The grove is certainly no hut providing absolute sanctuary from the mountain weather, but it weakens the lashing wind. 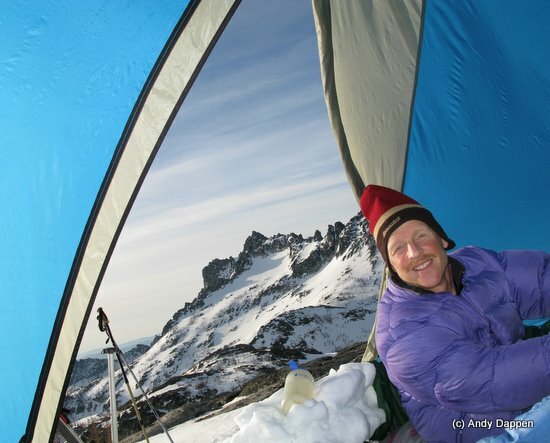 With our shelter pitched, we lounge and cook on the snow-free granite slabs beside us. Our seats are breezy but, with sleeping bags draped over us, we sit comfortably without the need of a grand hut. And with no hut there are fewer people. 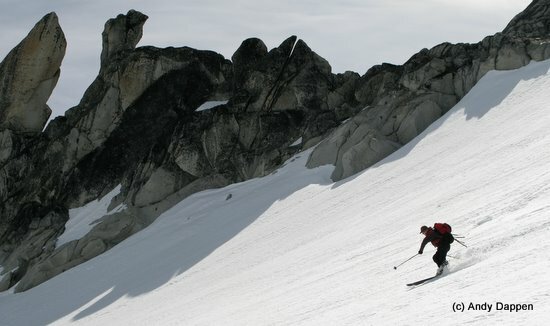 In Europe, it was not unusual to share popular destinations with 50 other skiers. On this Saturday in one of Central Washington’s more popular backcountry destinations, there are three parties camped within a square mile of each other. Sunlight slaps the tent early and, despite the gusting wind, our living quarters warm instantly. We eat and by 7:30 a.m. we’re striding uphill on skinned skis. We tour up to the western ridgeline of Enchantment Peak and look across the deep gulf separating us from Cannon Mountain before descending the crusted slopes funneling into Isolation Lake, one of the highest, barest lakes in the basin. We wander up Dragontail Peak and look down walls so sheer they almost make us hurl the food we snack on. This compact range is sharp, thorny, raw and spectacular. In all truthfulness, however, it’s neither as glaciated nor as grand as the surroundings we once enjoyed in the Alps. For men who are no longer as grand as they once were, the environs embody our own shrinkage. Next we climb around the backside of the Northeast Towers and Witches Tower along the Dragontail Plateau. 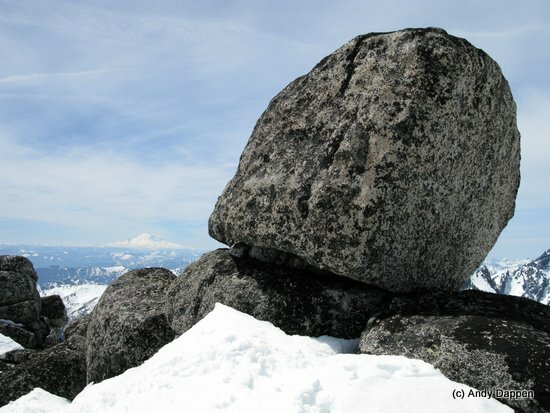 The boulders bordering the western ridge of the plateau are implausible shapes and provide outrageous foregrounds for framing Mount Rainier levitating above the horizon. Thirty years ago each picture we snapped was a calculated budget item costing nearly 30 cents per shot. On a weeklong trip yielding spectacular views of Mt. Blanc and its satellites, we might squeeze-off 20 frames of Kodachrome. Today, the camera is in constant use–Bill and I both snap dozens of frames as we meander along this one ridge. Before the day is done, we drop off the Dragontail Plateau and carve turns to a rocky perch above Isolation Lake. Then we skin to the top of Little Annapurna and ski gloppy north-facing snows that, with each cut of the skis, create posses of wagonwheels that chase us down hill. It’s after 5 p.m. by the time our ski legs are shot and we’re lounging on the Lazy Boy slabs bordering the tent. A warm wind mounts overnight and the walls fortifying our tent sag. The canopy overhead sags, too, and it flaps viciously all night. Dozens of snoring skiers in a hut or a tent flapping in the wind – sometimes good sleep in the mountains is simply hard to come by. We roll out of the sack groggily at about 6 a.m. and it’s apparent from the soft snow around the tent and the blue sky overhead that the day will be a scorcher. Bill and I discuss how badly we were burned on some of our tours of old. My lips were so fried after the Grand Combin trip, that when I rendezvoused with my girlfriend after the trip, a girl I hadn’t seen in nine months, I couldn’t bear to kiss her. We slather on the sunscreen, descend to Perfection Lake, and start skinning up the north side of McClellan Peak to a notch west of the true summit. 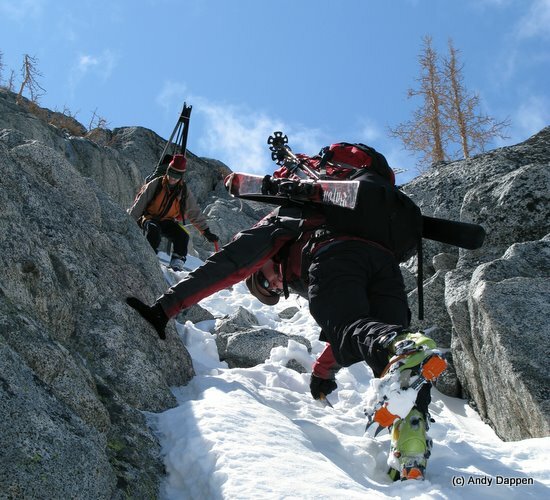 Small portions of this ascent are steep and sometimes it’s easier to shoulder skis and boot upward. For Jake who is the incarnation of the vigor and confidence we once possessed, these steeps are of little concern—Jake is still immortal. For the two of us who feel mortality palpably in specific joints, a place where the body might slide out of control from a fall is also a place where imagination can easily slide out of control. Ski touring becomes both a greater physical and mental challenge with age, and yet Bill is amazed that, when prodded, the human body and the human spirit can plug along for so long. 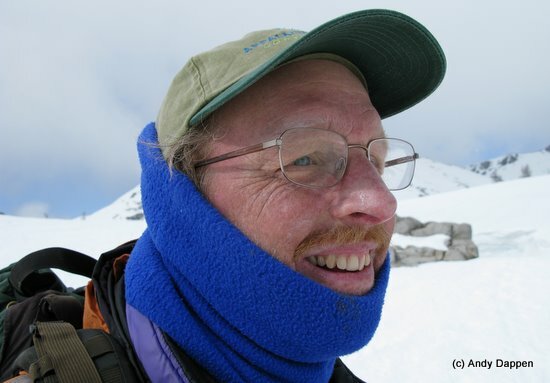 Photo: Bill Birchard prepared for windy, whiteout weather. The weather turns cold overnight and a hard freeze solidifies the snowpack. Clouds, like chamois clothes, swirl around the mountains as if to polish the peaks. With visibility blinking in and out, we ski up and over Prusik Pass. On the far side of the pass and in a temporary whiteout, I take a bearing from the map and strike out toward Cannon Mountain. Bill remembers this form of travel from our Euro days. Often we skied through chowder weather to poise ourselves for a peak we wished to summit. 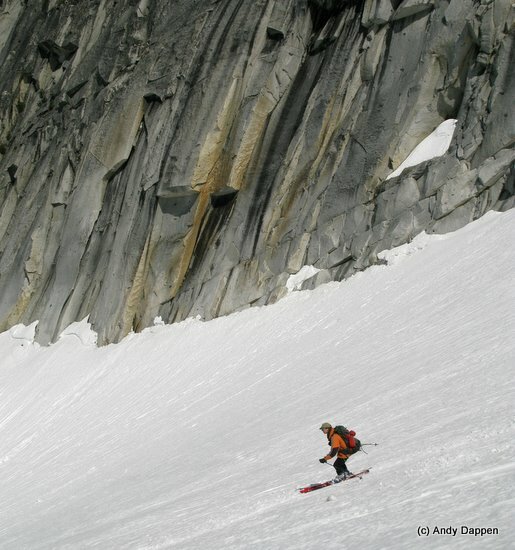 Frequently Bill skied out ahead of me as we crossed a treeless expanse of glacier or up a barren slope. I would sight him with the compass and directed him left or right. When he intersected the desired bearing, I would yell, “Mark!” He would probe that spot several times with his poles before trudging onward across the white canvas. I would sprint to the marked point, re-sight the bearing, and direct Bill left or right again before yelling “Mark.” On we’d go for hours at a time. Near the Wildstrubel Hut, we skied five kilometers across and up a glacier through visibility so poor that Bill would sometimes dissolve if he was more than 20 yards away. Bill regularly railed against the prospects of reproducing the European hut system in North America, yet as we skied the Alps with no sleeping bags, no tent, and no stove, his relief would be palpable when the shelters we aimed for materialized from the mist. “Thank God for the hut,” he’d mutter. Photo: Descending the top of Aasgard Pass. The evening clouds have blown east into Idaho and clear skies remain. We’ve skied most of the surrounding peaks and decide to descend to Colchuck Lake where we’ll drop the camping gear and dash up Colchuck Peak via the Colchuck Glacier. 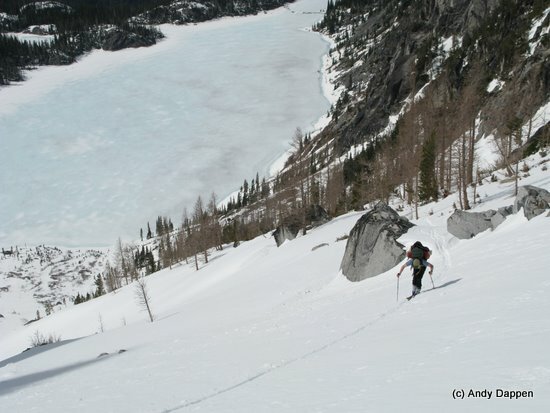 The top of Aasgard Pass is so firmly frozen we don crampons and pack the boards for the initial descent. Sunlight is softening the slopes by the time we’ve descended 500 vertical feet and we take a short break. Over the course of 45 minutes the sun alchemizes the snow underfoot from cement to corn and we enjoy a signature descent down a carpet of white velvet flanked by towering black walls. At lake level, our excess gear is cached on a massive, flat boulder where we’ll camp before we strike off for the col between Dragontail and Colchuck peaks. Quality skiing is exactly what we get. The top of the run is firm and the thin surface crust shatters beneath or skis into backlit shards of glass that bounce down the slopes with us. By mid mountain, the snow has softened and we’re skiing effortlessly through an inch of corn. The snow continues to soften and, as we approach camp, we’re skiing through six inches of wet, granular snow that carves rather collapses. Between the length of the run, quality of snow, height of the granite walls surrounding us, and the directness of this turnpike plummeting into Colchuck Lake, Jake proclaims it the best run of the trip. I suspect this descent will crystallize in Jake’s memory much like our descent of the Grand Combin became a crystalline memory for us. We’ve been out of the mountains for several days but multi-day trips, with their combinations of death marches and brilliant memories, often take on a life of their own. The ease of using the microwave at home reminds you of the stove blasting inside the tent. The luxury of a king-sized bed reminds you of the claustrophobia of a mummy sack. And the photos you process chronicle those special flashes of joyful misery or wicked jubilation. I’m grappling with melancholy– I still want to be out skiing, not writing about it. But there’s greater depth to this melancholy. Thirty years have leaked from my life with the speed of air vacating a released balloon. It seems like 10 years, not 30, when Bill and I skied Europe… if we wait this long before another reunion tour we’ll be dead or too dilapidated to shuffle skis. Photo: Enchanting memories on McClellan Peak. Approach: Once the Eightmile Road opens (mid to late April), skiing from the Mountaineer Creek Trailhead, to Colchuck Lake and over Aasgard Pass is the quickest approach. 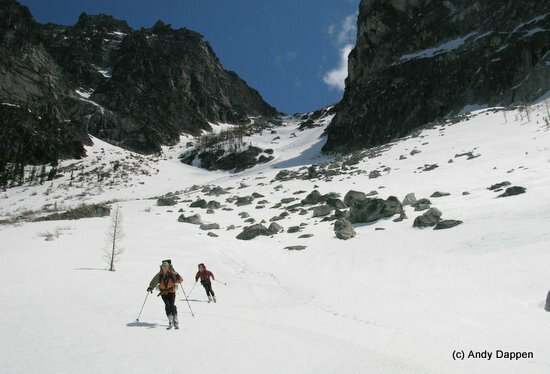 In earlier season when the Eightmile Road is still closed, skiing 7 miles up Ingalls Creek and skinning up Crystal Creek into the Enchantments is a good alternate approach. See our hiking guidebook for the details about hiking to Colchuck Lake or along Ingalls Creek. Access: If approaching the Enchantments from Colchuck Lake and Aasgard Pass, leave Icicle Junction at the west end of Leavenworth and drive the Icicle River Road for 8.5 miles; then turn left on the Eightmile Road and follow this 4 miles to the Mountaineer Creek Trailhead. If approaching from Ingalls Creek and Crystal Creek, drive Highway 97 south from the Y-Junction about 7.5 miles and turn right onto Ingalls Creek Road. Cross the bridge, turn left, and drive about a mile to the trailhead. Permits and Passes. 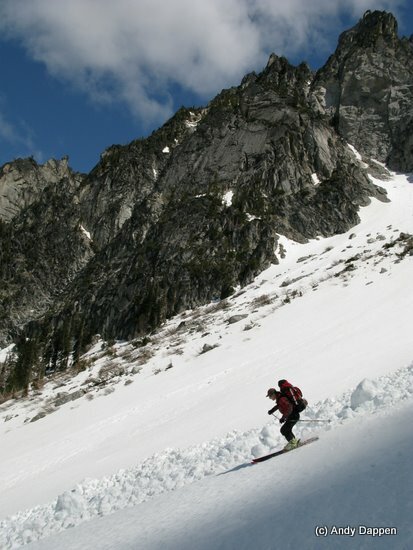 To ski in the Enchantments before June 15 does not require an Enchantment Area Wilderness Permit. The different trailheads to access the Enchantments, however, do require a Northwest Forest Pass. Maps. 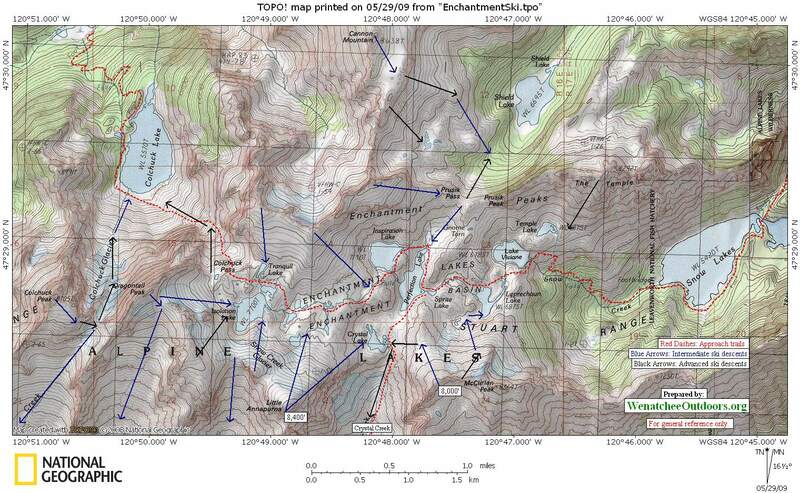 Print our topographic map on 8.5” x 14” paper in landscape mode.